As the music and chanting continued, so a few women stumbled forward from the audience to a small, clear space in front of the musicians. There, seemingly in states of considerable distress, they danced in a stiff, flailing fashion in time with the bendir beats. As dancing became more vigorous and the women increasingly distraught, so they cried out as if in pain, or called repeatedly to 'Allah' until, one by one they collapsed, fainting, into the arms of the other women at the front of the audience and the music came to an end (5). This state of musically-induced intoxication was known in Oujda as hadra, although this name was also given sometimes to the event itself. During the interlude between such pieces, the Fqira stood up and exhorted on the proven power of the almighty, through the saints' intercession, to relieve the audience's problems. She also asked the audience to buy sugar-cubes wrapped in newspaper, which, she suggested, conveyed a share of the spiritual power, or baraka, which the ceremony had generated (6). The women's own understanding of what took place at the Aissawa was based upon a magical explanation of misfortune. If, for example, a person suffered a whole series of small accidents, or every attempt to better the circumstances of her life failed, it might be suspected that djinn, minor but malevolent spiritual beings, had come into her body. This typically occurred through some careless, polluting act, for example, being accidentally splashed with dirty water. Similarly dangerous were psychic contaminations, such as receiving 'el aïn' , or the evil eye, perhaps from a jealous neighbour or a malevolent stranger. Such a diagnosis could be confirmed by visiting an appropriate maraboutic shrine, where a resident talib, or 'diviner' (literally 'student') had the ability to identify spiritual afflictions and prescribe a mixture of charms and rituals to either placate or exorcise the djinn. 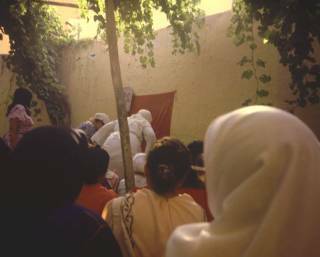 The Aissawa was one of a number of groups in Oujda to whom a sufferer might be referred for musical/therapeutic treatment. Although many ensembles of this kind were musically and performatively very different from one another, they all served the same purpose of relieving women of djinn, and all involved dance, emotional catharsis and collapse (7). A very common belief which appeared to underlie these, and many other practices in the region was that all musics were able to penetrate the boundaries of the listener's psyche and communicate directly with a persons emotional and spiritual nature (8). When a chant relating to a particular marabout was sung, those women who had visited the saint's shrine, or were afflicted with problems associated with him, were moved to dance, and as such, the music served as an invocation of his authority over particular kinds of djinn. This performance cycle was repeated, with minor thematic and musical variations, throughout the afternoon, with different women coming forward to 'dance' for each series of chants. Of an audience of perhaps one hundred to a hundred and fifty women, less than a quarter of these were moved to dance on any particular day. The others had obviously come for social or entertainment reasons, as much as for religious or therapeutic purposes. Empathetic, and frequently physical, support was afforded to the dancers; otherwise the audience took part by singing, clapping and by discussing the proceedings with their neighbours. The atmosphere was almost always one of relaxed good humour, with jokes, banter and light-hearted commentaries exchanged whenever there was a gap in the musical proceedings. Gatherings ended in the late afternoon, when groups of women drifted off home to prepare evening meals for their families.